Tirol is one of the best known regions in Austria. It was once called “land in the mountains”. It offers beautiful landscapes, great ski areas, extensive wellness possibilities, a wide range of sports, impressive culture, untouched nature and clean air – in short – a perfect place to spend your vacation. Its ideal geographical situation makes it a frequented region: Germany in the north, Switzerland and Vorarlberg in the west, Italy in the south and Salzburg and Carinthia (both Austria) in the east. South Tirol was ceded to Italy in 1919. Since then, the East Tirol is isolated from the rest of Tirol and can be accessed via Salzburg (Felbertauern tunnel) or Italy (Pustertal valley) only. About 20 percent of the landscape is declared nature preserve and only 13 percent of Tirol is populated. A wide choice of sports activities are offered in summer as well as in winter: Canyoning, golf, surfing, hiking, biking etc are just a few to mention. In winter, ski lovers and snowboarders spend their vacation in the heart of the Alpes. St. Anton, Soelden, Kitzbuehl or Seefeld: you can choose your preferred ski region. More than 4400 km/2734 miles of groomed slopes await you and more than 1150 lifts take you to the peaks. If you like to do cross-country skiing, you will find more than 5000 km/3107 miles of immaculately groomed tracks. Wellness hotels are offering all kinds of relaxing possibilities – a nice treat after spending hours hiking, biking or skiing. Families also love to spend their vacation in the Tirol where special Children’s Hotels and family resorts wait to pamper you and offer a wide variety of children’s programs. Discover Tirol’s proverbial cozy atmosphere and make yourself feel at home. Friends of architecture will mostly find Gothic structures, especially in churches. Some Renaissance works have remained as well as some Baroque examples. Visit Innsbruck and find some fine Renaissance sculptures. 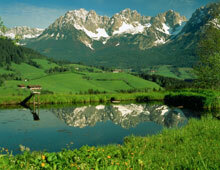 Do not hesitate to visit Tirol with its many attractions and activities – an unforgettable holiday.